Yippie-i-oh! 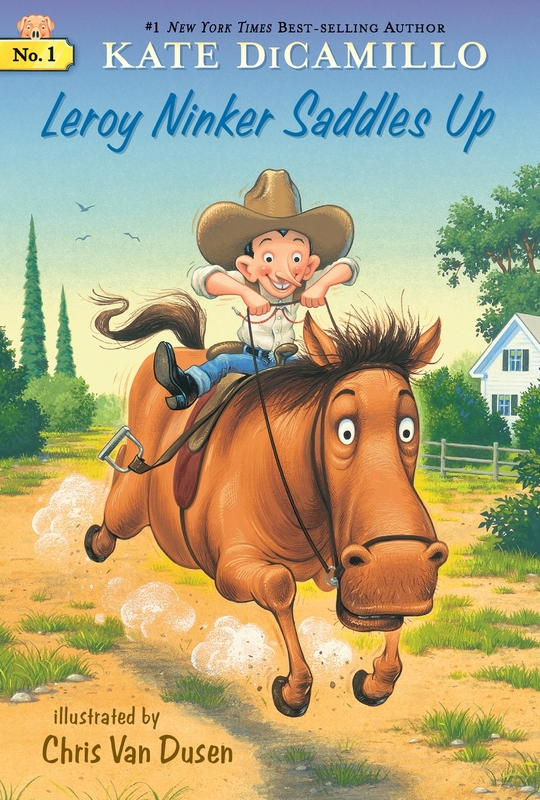 Saddle up for the first in a spin-off series starring favorite characters from Kate DiCamillo’s New York Times best-selling Mercy Watson books. Leroy Ninker has a hat, a lasso, and boots. What he doesn’t have is a horse-until he meets Maybelline, that is, and then it’s love at first sight. Join Leroy, Maybelline, and everyone’s favorite porcine wonder, Mercy, for some hilarious and heartfelt horsing around on Deckawoo Drive. Kate DiCamillo is the beloved author of many books for young readers, including the Mercy Watson and Tales from Deckawoo Drive series. Her books Flora & Ulyssesand The Tale of Despereaux both received Newbery Medals. A former National Ambassador for Young People's Literature, she lives in Minneapolis. Chris Van Dusen is the author-illustrator of The Circus Ship, King Hugo's Huge Ego, Randy Riley's Really Big Hit, and Hattie & Hudson, and the illustrator of the Mercy Watson and Tales from Deckawoo Drive series as well as Mac Barnett's President Taft Is Stuck in the Bath. Chris Van Dusen lives in Maine.